Banner Mattress has many finance and payment options to help you get the mattress of your dreams. Get up to 60 Months Special Financing* with Synchrony on qualifying purchases made with your Banner Mattress credit card. Fortiva works for customers with past credit problems with upto 12 Months Interest free and upto 24 months to pay. Snap Finance takes customers with no credit and helps them get the things they need offering upto 12 months to pay. And Of course, there is always Free Layaway for up to 4 months at Banner Mattress. All online credit approvals must be presented in-store prior to purchase. Call or visit any Banner Mattress location for complete financing and payment option details. on qualifying purchases made with your Banner Mattress credit card. Prefer to talk with a live person? Just visit any Banner location, and your Salesperson will provide you with a Synchrony Bank financing application for you to get the bed of your dreams today! Fortiva Retail Credit is a revolving line of credit financing program offered by The Bank of Missouri. We understand that times can be hard and not everyone has perfect credit, so the Fortiva Retail Credit solution is here to help those who have excellent, fair and even not so good, credit history. Not to mention, we do all of this with a fast, easy and INSTANT decision! Our "no credit check" option. 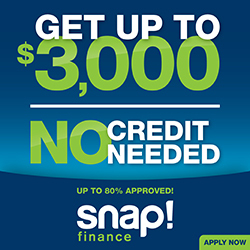 Snap Finance provides easy financing for people with bad credit. Even if you have no credit, Snap is a great way to finance the things you need. Not ready to purchase yet but you want to take advantage of our current sales event or pricing? Waiting to remodel or move? Try our Banner Mattress in—store FREE Layaway Plan. Take up to four months to lock in your price savings. If there is no account activity, layaways will be cancelled after 60 days, and the customer will receive a credit to their account good for one year from the date of the last payment. If the layaway item becomes discontinued, we reserve the right to substitute a product of equal or greater value. Apply online, then call 888-3-BANNER (888-322-6637) with your approval. TeleSales is available Monday through Friday 9:00am - 5:00pm. We say YES when others say NO. Fortiva is ready to help. Lending solutions are available for customers with past credit problems or limited credit. Paypal Credit makes it simple for you to make big purchases without the burden of having to spend all that money at once. Utilizing Paypal Credit only requires that you have or make a PayPal Account upon which a credit check may be necessary. You can normally be approved within seconds and you'll be on your way to a "No Payment + No Interest if paid in Full 6 Months when you spend $99 or more." It's just like having the benefit of opening up a new card every time where you have no interest as long as you pay it off by the allotted time. Make buying your next mattress a breeze by utilizing the PayPal Credit option we have available. You will need to choose the option for Paypal Credit at checkout. When you reach the checkout page you'll notice that there is a PayPal payment option and a credit card payment option. Please select the Paypal payment option. You will need to log into your Paypal account or if you do not have one you will need to create one in order to apply for PayPal credit. Once you have logged in or created your account you will now see there is an option to pay with PayPal Credit. Click apply for PayPal credit and follow the on-screen instructions. Be sure to check that the promotion for the 6 months to pay is still active as this deal can change from time to time depending on what PayPal decides to set it as.